Sales Advisor: Typically there are inbound sales advisors and outbound sales advisors. Inbound respond to calls coming in from new or existing customers and are generally looking to buy a product or service or at the least open to having a discussion. Outbound sales advisors will make a mixture of cold calls to sell a product or service or they could be calling existing customers to sell them a related product or service or up sell associated products or services and these existing customers are often referred to as “warm leads”. An ambitious, self-motivated and highly driven sales professional with a proven track record in exceeding targets. 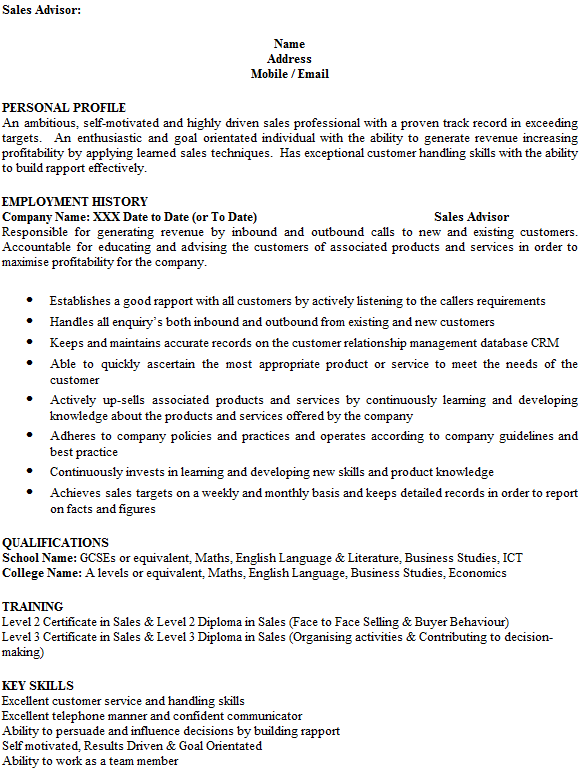 An enthusiastic and goal orientated individual with the ability to generate revenue increasing profitability by applying learned sales techniques. Has exceptional customer handling skills with the ability to build rapport effectively. Responsible for generating revenue by inbound and outbound calls to new and existing customers. Accountable for educating and advising the customers of associated products and services in order to maximise profitability for the company.